To succeed in business and life you have to learn to compromise from time to time. The trick is to compromise without losing what you need to attain your goal. Earlier today I watched a vlog of Bob Parson about “You can negotiate anything”. He detailed 6 quick tips for doing it right. Here are some important stuffs he had mentioned about. Before beginning any negotiation you should have a clear idea of what you want and what you are ready to let go. Plan properly and make the right move. Don’t back your self to a corner by starting negotiations too late. Be as direct as possible by telling the other side what you exactly want. Most importantly if you are not dealing with a decision maker have someone else who is not a decision maker on your behalf to keep the playing field even. People who are new to negotiate feel embarrassed to negotiate. Anyone who is trying to sell you anything will always consider a better price to close a great deal with you.The worst they can ever say to you is NO but more often the answer will be YES, also you will find a way to get quickly what you want. When this happens don’t hesitate to ask something else. Something more. It always to get a better deal! Those who talk too much during a negotiation is the one who lose. When you talk you have no way to get to know about opponent’s concerns and needs. This is always a mistake. If you understand both your goals and opponent’s goal you would have a good idea how to position your needs and you might have an idea of what you can give up to keep the deal alive. 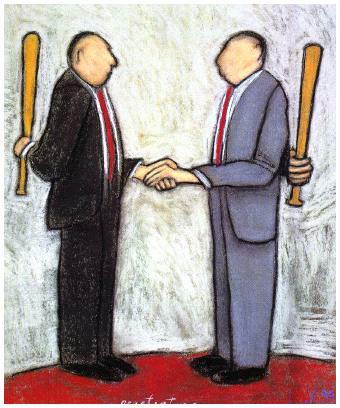 Your behavior and attitude during the negotiation determine everything. Keep your self cool. The moment you allow your self to become angry is the moment you lose. Never ever give up what is important to you in the deal. If you lose any ‘must-have’ stuffs, it might create negative feelings in the future or it might even ruin the relationship. This might be the most important rule for negotiation. When both parties are on the opposite direction of the deal it’s always to move out than risking a bad deal. Prepared for the worst and have a plan when things break down. Remember, Smart business person never falls in love with the deal. Never let anybody push you around.